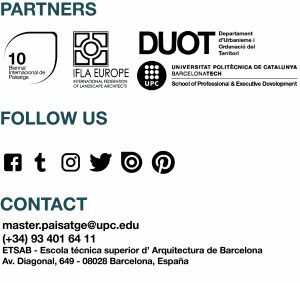 GENERAL INFORMATION – Master in Landscape Architecture Barcelona – Universitat Politècnica de Catalunya – 35ª EDITION. We share with you the video of our Master in Landscape Architecture that won the Open Creatiu prize at the 2018 Catalunya advertising festival in the “Gold” category. DO YOU KNOW HOW THE MASTER’S STRUCTURE WORKS?